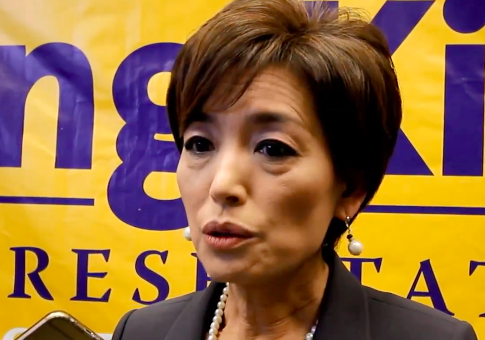 A California judge rejected a lawsuit aimed at denying GOP candidate Young Kim, who is running to replace Rep. Ed Royce (R., Calif.), the right to identify herself as a small business owner on the November ballot. Superior Court Judge Allen Sumner, in his ruling last week, determined that the suit did not contain sufficient evidence to raise legitimate legal questions about Kim's use of the label. "The court is not convinced petitioners have even made a prima facie showing Kim's ‘small business owner' ballot designation is either false or misleading," the judge wrote. "Assuming they did, Kim's declaration sufficiently rebuts any such showing." The Kim campaign blamed Democratic opponent Gil Cisneros for using part of his $266 million in lottery winnings to fund the "frivolous" lawsuit they say is aimed at impugning her honesty and legitimate public relations work as the owner of YK Connections. Cisneros campaign spokesman Nic Jordan said two small-business owners in the district filed the lawsuit, not the Cisneros campaign. He did not respond to repeated questions by the Washington Free Beacon on whether Cisneros helped fund the lawsuit in any way. "Young reported $0 in income from the business, she did not report having a position with the company, she did not report having a business of any value, and she has not registered to pay business taxes with the city of Fullerton," Jordan said. "The question is if Young Kim does, in fact, own a small business, then why has she not paid taxes?" In rejecting the lawsuit, the judge determined the case was unmerited because it didn't consider that the business in question, YK Connections, is a sole proprietorship and is not required to file taxes or incorporation documents with the state. Instead, sole proprietor businesses file income and losses on personal income tax returns. The judge said the lawsuit also improperly cites the absence of any income from YK Connections on a federal financial disclosure form as evidence that the business is defunct. Instead, the judge found that the disclosure form shows $10,000 in earned income from KBS America and $4,000 from South Baylor University in 2017 and explains that those two entities are clients of YK Connections, which is a sole proprietorship that generates approximately $10,000 per year in income. "She acknowledges that YK Connections does not take all of her time but states it is currently her only employment or source of active income, and her only professional occupational or vocational endeavor," the judge wrote. "For the past 18 months, she has divided her time between campaigning and working on YK Connections." Kim's ballot description was approved by California's secretary of state for the June 5 primary and went unchallenged. Kim is a former California state legislator who served in the Assembly from 2014 to 2016 after working in Rep. Ed Royce's office as a director of community relations. Cisneros is a former shipping and manufacturing manager for Frito-Lay who won a Mega Millions jackpot worth $266 million in 2010. After Kim and Democrat Gil Cisneros were the top two finishers in the primary, two district voters challenged the "small business owner" description for Kim, arguing that it is "improper and misleading" because the business in question, YK Connections "appears" to have been "defunct since 2016." "Again, petitioners fail to persuade," the judge wrote. "YK Connections is not defunct, and Kim earned over $14,000 in income from it in 2017." This entry was posted in Politics and tagged 2018 Election, California, Ed Royce. Bookmark the permalink.